Some of the many varieties of beans for sale at the daily indigenous market in San Cristóbal de las Casas, Chiapas. The metal cup measures one kilo (2.2 pounds). The Spanish word frijol is a bastardization of ancient Spanish frisol, which itself is a rendering of the Catalán word fesol--which comes from the Latin scientific name--are you still with me?--phaseolus vulgaris. Is that more than you wanted to know about bean nomenclature? Here's yet another little bit of Mexican bean esoterica: in Mexico, when you go to the store or the tianguis (street market) to buy beans, you are buying frijol. When you prepare the frijol at home, the cooked beans become frijoles. That's right: raw dried beans in any quantity: frijol. Cooked beans, frijoles. If you ask a tianguis vendor for a kilo of frijoles, he could rightfully send you to a restaurant to make your purchase. The simple utensils you need to cook dried beans: an olla de barro (clay pot) and a strainer. You can also use a heavy metal pot, or a pressure cooker, but the clay pot adds special flavor to the cooked beans. These pale yellow, long-oval beans are frijol peruano (Peruvian beans, or phaseolus vulgaris), the most commonly used bean in the Central Highlands of Mexico. A clay bean pot has been fired at a temperature substantially higher than the heat of your stove burner, so there's no need to worry about it breaking when you use it to cook. Mexico Cooks! loves beans. In our kitchen, we prepare about a pound of dried beans at a time. After cooking, this is enough frijoles de la olla (cooked-in-the-pot beans) to serve, freshly cooked, for a meal or two, with plenty left over to freeze. We freeze the rest of the cooked beans in five or six two-portion size plastic sandwich bags. Cooked beans and their pot liquor freeze very well. I found this little batch of rocks, discolored or very wrinkled beans, and other garbage in the half-kilo of frijol that I cooked yesterday. Beans are very easy to cook. First, pick carefully through your beans. Even if you buy bulk beans or commercially packaged dry beans at a modern supermarket, be certain to pick through them and discard any beans that look badly broken, discolored, or wizened, as well as any small rocks. You may also find pieces of straw, pieces of paper, and other detritus in any purchase of beans. Put the cleaned beans in a strainer and wash well under running water. To soak, or not to soak? Some folks recommend soaking beans for up to 24 hours to shorten their cooking time, but Mexico Cooks! has tried both soaking and not soaking and has noticed that the cooking time is about the same either way. We never soak. You try it both ways, too, and report back with your findings. Epazote (wormweed) grown in a maceta (flower pot) on my terrace. Just before turning on the fire to cook the beans, Mexico Cooks! adds two sprigs of epazote, just about this size, to the pot of beans and water. The strong, resinous odor of the herb absorbs almost entirely into the beans, giving them a mild flavor punch and, some say, diminishing flatulence. My olla de barrlo (clay bean pot) holds about a half kilo of frijol plus enough water to cook them. You can see the light glinting off the water line, just below the top part of the handle. If you don't have an olla de barro, a heavy metal soup pot will do almost as well. The clay does impart a subtle, earthy flavor to beans as they cook. Over a high flame, bring the pot of beans to a full, rolling boil. Turn the flame to a medium simmer and cover the pot. Allow the beans to cook for about an hour. At the end of an hour, check the water level. If you need to add more water, be sure that it is boiling before you pour it into the bean pot; adding cold water lowers the cooking temperature and can cause the beans to toughen. Continue to cook the beans at a medium simmer until, when you bite into one, it is soft and creamy. The pot liquor will thicken slightly. Now's the time to salt your beans--after cooking, not before and not during. We use Espuma del Mar (Mexican sea salt from the state of Colima) for its wonderful sweetly salty flavor, but any salt will do. Add a little less salt than you think is correct--you can always add more later, and you don't want to oversalt your beans. If you live in the United States or Canada, you'll want to order the fabulous heritage dried beans sold by Rancho Gordo. Rancho Gordo's owner, my friend Steve Sando, has nearly single-handedly brought delicious old-style beans to new popularity in home and restaurant kitchens. If you've tasted ordinary beans and said, "So what? ", try Rancho Gordo beans for a huge WOW! of an eye opener. Mexico Cooks! likes frijoles de la olla (freshly cooked beans, straight from the pot) with a big spoonful of salsa fresca (chopped tomato, minced onion, minced chile serrano, salt, and roughly chopped cilantro). Sometimes we steam white rice, fill a bowl with it, add frijoles de la olla and salsa fresca, and call it comida (main meal of the day). Chiles serranos and manteca (lard)for frijoles refritos estilo Mexico Cooks!. For breakfast, Mexico Cooks! prepares frijoles refritos (refried beans). Served with scrambled eggs, some sliced avocado, and a stack of hot tortillas, they're a great way to start the morning. A dear friend from Michoacán taught me her way of preparing refried beans and I have never changed it; people who say they don't care for refried beans eat a bite, finish their portion, and ask for seconds. They're that good. Here's some more bean trivia: frijoles refritos doesn't really mean 'refried' beans. 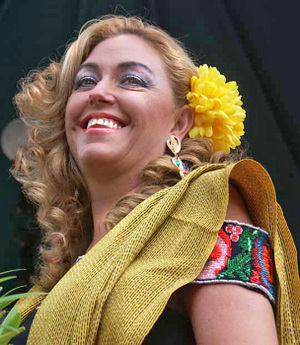 Mexican Spanish often uses the prefix 're-' to describe something exceptional. 'Rebueno' means 'really, really good'. 'Refrito' means--you guessed it--well-fried. Melt about a tablespoon of manteca (lard) in an 8" frying pan. Split the chiles from the tip almost to the stem end. Fry the chiles until they are blistered and dark brown, almost blackened. To prevent a million splatters, allow to cool a bit before you add the beans to the pan. Melt the lard in an 8-inch skillet. Split the chile(s) from the tip almost to the stem end and add to the melted lard. Sauté over a medium flame until the chile is dark brown, almost black. Lower the flame and add the beans and a little bean liquid. When the beans begin to simmer, mash them and the chile with a potato or bean masher until they are smooth. Add more liquid if necessary to give the beans the consistency you prefer. Add sea salt to taste and stir well. Leave the melted lard and the chiles in the frying pan and add the beans and some pot liquor. Bring to a simmer over low heat. When the beans are hot, start mashing them with a potato or bean masher. Mash the chiles, too. These beans are about half mashed. Mexico Cooks! prefers that frijoles refritos have a little texture. These are just right for us, but you might prefer yours perfectly smooth. If you like them smoother, keep mashing! Either way, the beans should be thickly liquid. If the consistency is too thick, add more pot liquor. If the beans are too thin, add a few more whole beans to mash. For a wonderful breakfast or supper treat, try making molletes estilo Mexico Cooks!. This is real Mexican home cooking; Mexico Cooks! has never seen this style molletes served in a restaurant. A wonderful Michoacán cook taught me how to prepare this easy meal. Start with fresh pan bolillo (individual-size loaf of dense white bread), split in half lengthwise. Butter the cut bolillo halves and grill them on a comal (griddle) or hot skillet till they're golden brown. If you aren't able to buy bolillos where you live, use a dense French-style bread instead. Spread each half bolillo with a thick coat--two tablespoons or more--of frijoles refritos. Top the beans with a freshly fried egg and your favorite bottled or home-made salsa. Salsa cruda (also known as pico de gallo) is the home-made salsa that I prefer with molletes. Use finely diced perfectly ripe tomatoes, just a bit of minced white onion, as much minced chile serrano as you prefer, a lot of coarsely chopped cilantro, and salt to taste: voilà! Photo courtesy A Bit of Saffron. Breakfast, estilo Mexico Cooks!, will keep you going strong till time for comida. You're going to love these beans! 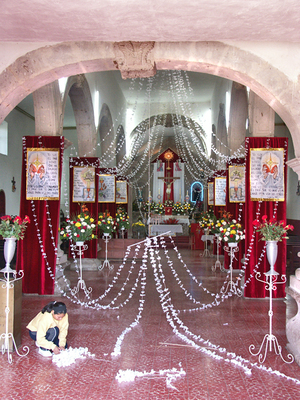 Decorating the church for the feast day of St. Luke, in San Lucas Evangelista. Several years ago on the Catholic feast day of Saint Luke, I invited my friend Julia to drive to San Lucas Evangelista, Jalisco, with me to meet the coheteros (fireworks makers). It was the final day of the fiestas patronales (patron saint's festivities) for Saint Luke and I knew his little namesake town would be in full party mode. We drove along the main street of the tiny town looking for the church. Usually a village church is easy to locate—I just look for the church tower and point the car in its direction. This town was different; we couldn't see a tower. Finally I pulled to the side of a narrow street and asked an elderly shawl-wrapped woman how to get to the church. I was momentarily puzzled, but then light dawned. "Because of the fiestas?" "Yes, the whole street is blocked with the rides and booths. You need to go to the last street in town," she pointed, "and park your car there. Then you can walk." She shook her head, scandalized by the madness of the fiestas. Chuckling, I followed her directions and parked the car almost directly in front of the church, but on the rocky unpaved side street rather than the main street. We walked a few meters to the churchyard and immediately saw that the castillo (the "castle", a large set-piece fireworks display) was under construction. We also noticed that the church has no tower—no wonder we hadn't spotted it immediately from the edge of town. 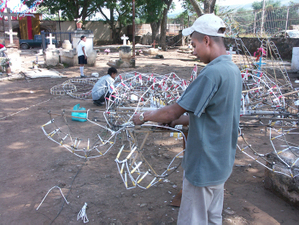 Coheteros preparing the castillo in San Lucas Evangelista. As I approached a group of men working on part of the castillo, they stood up to greet us. "Buenas tardes, how can we help you?" I explained that I was interested in talking to the boss about the fireworks and that I was going to write an article about the fireworks. The first young man laughed and pointed at a second young man crouched on the ground working. "Talk to him, he's the boss's son. He'll help you." Then he laughed even harder. The young man in question rolled his eyes and grimaced. Very shortly that man came over and shook my hand. 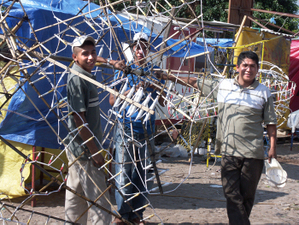 "I'm Manuel Zúñiga of Cohetería del Pueblo (Town Fireworks Makers). My worker said you wanted to talk with me?" I explained my interest again and he became very serious. 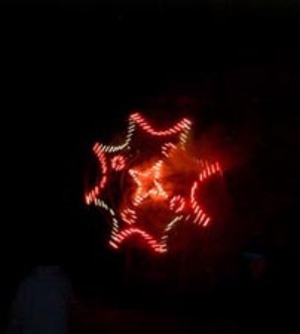 A spinning castillo (castle) lights up the night. "You have to explain to your readers that my profession is not dangerous. The majority of accidents happen because of juguetería, the small 'toy' fireworks such as palomitas (poppers) and luces de Bengal (sparklers) used by children. Those fireworks are imported from China and are much less stable than the ones we make here in Mexico. Those are very dangerous, very. 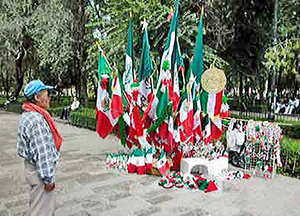 "Yes, there have been some bad accidents with our kind of fireworks, like the one in Veracruz in January 2003 (28 people were killed and more than 50 were injured when illegally stored fireworks exploded in a central market), but those incidents are very unusual. "Our philosophy is that one person dies, but others follow in his footsteps and the work carries on and becomes better. "My family has been making castillos, cohetes (rockets), bombas (bombs) and other fireworks for three generations. My grandfather, may he rest in peace, started making fireworks in San Juan Evangelista, the next town over there," he gestured to a spot in the distance beyond the church, "and then the whole family moved to Cuexcomatitlán, just up the road from here, and we've lived there ever since." "It's always been a family business. You might say that we're Zúñiga and Sons." He smiled broadly. "I'm Manuel Zúñiga, at your service. We make a unique style of fireworks and we're very good at it. 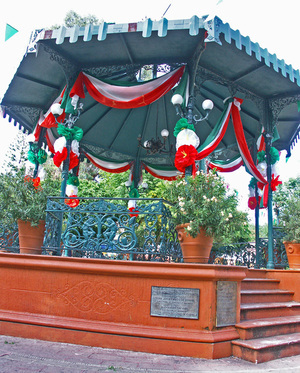 We've won many contests, including first place in the State of Jalisco. 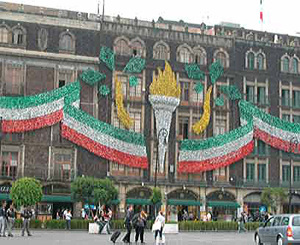 We've been asked to be judges at a pyrotechnics contest in the State of Mexico. "Most people think that the Chinese are the kings of gunpowder, that China is the world capital of fireworks. We've found out that the tradition of fireworks is very strong in England and that the English are really more knowledgeable than the Chinese. Their designs and innovations are at the forefront. We hope to travel to England one day to see their work in person." I was fascinated with the construction of the various parts of the castillo. "It looks as if you have to be an engineer to figure out how this entire thing fits together and works," I said, reaching up to move several parts of the mechanism. 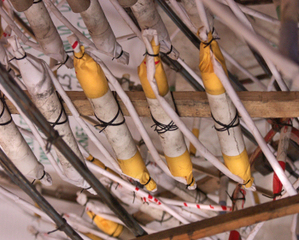 The fireworks attached to the wheels of carrizo (similar to bamboo) are color-coded. "Yes, it's very complicated. Every tube that you see attached to the structure is filled with gunpowder and the chemicals that create the colors of the designs. We use several different kinds of materials to make the framework, like carrizo (bamboo canes) and madera de pino (pine wood). The bamboo is very flexible, the pine is rigid. There are other kinds of wood that we use to give more shape to the designs. Some of the sections of the castillo are hinged so that they move up and down as they spin. "Designs are made with long thin tubes filled with gunpowder and with the thicker tubes that shoot fire. You might see flowers, a heart, a horse or a cow, or some religious symbols." He walked over to a large section of castillo lying on the ground and traced the outline of the design with his finger. "This one is a chalice with the communion host above it. Can you see it?" I certainly could. "It will look beautiful when it's lit up tonight." 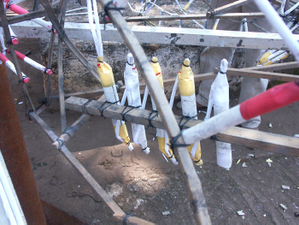 More tubes of gunpowder, color-coded and attached to part of the castillo. 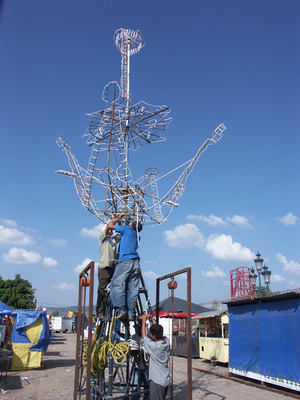 "When it's time to put the whole castillo together, the parts are set onto a pole. We start with the topmost part and then use a system of pulleys to raise it up. Then we add the middle section, and then the bottom part under that." "Come with me, I want to show you some other things." As we walked to the fireworks-filled storeroom next to the church, Sr. Zúñiga continued explaining the intricacies of his family business. "Here, this is something different. It's a torito, a little bull. See the shape? Late tonight, we'll bring these out to play." He laughed. "A boy carries this little bull over his head—yes, after it's lit and while it's exploding with color and fire—and runs through the crowd. He'll chase whoever looks like a good victim. He hunts for whoever looks nervous. 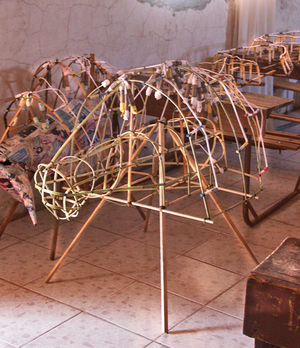 This torito has buscapíes fastened to it. Those are a kind of fireworks that shoots off the framework of the little bull and skitters along the ground. It literally means 'looks for feet'. It's only a little dangerous." He grinned and winked. These "toritos" are in fact turkeys, not little bulls. The young men standing behind the toritos made them; they explained to me that even though they're not little bulls, they're still called toritos. I grinned too, remembering a fiesta night in Guadalajara when a small boy with a blazing torito chased me down a cobblestone street as the festive crowd laughed to see the señora running to escape. A mid-section of a castillo, burning brightly in a churchyard. Sr. Zúñiga talked as we walked back through the churchyard. "We work all year round. There are 25 of us who build the fireworks. Raising the castillo in San Lucas Evangelista. 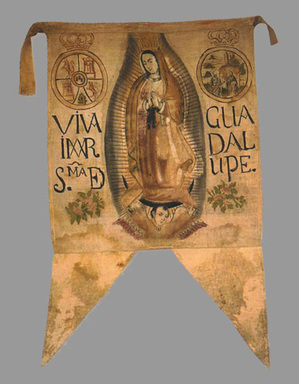 "We'll be in Ixtlahuacán de los Membrillos on October 21 for a visit of Our Lady of Zapopan and in Ajijic on October 31 for the last day of the month-long celebration for Our Lady of the Rosary. There will be a castillo in each town. Of course we've already started preparations for the nine-day festivities in Ajijic at the end of November." We gazed up at the castillo being mounted just outside the cemetery fence. Curious, Julia asked him, "What does it cost to have one of these built?" "The simplest ones start at $7,500 pesos—about $665 U.S.. The price goes up from that to about $20,000 pesos—about $1,800 U.S.—for more complicated castillos built on a central pole, like this one. Then there is another category of castillo, much more complex, that starts at $25,000 pesos. For that kind, the sky's the limit." He shook my hand. "Can't you stay until we burn this one at around eleven o'clock tonight?" A castillo in all its brief glory in La Barca, Jalisco. "I wish I could—maybe next year." With a last look at the work in progress, Julia and I headed for the car. I knew I'd dream of castillos that night. The sky was the limit.